...then you definitely need to shell out a premium price? And since you’re shelling out a premium price, why not look for the most comfortable noise cancelling headphones out there, shouldn’t you? ...but your ears hurt while using it. ...those are surely going to sound great, without your ears gasping for breath. 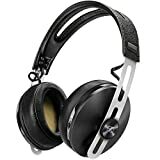 Momentum 2.0 Wireless Noise Cancelling Headphones is the 2nd generation of Sennheiser’s Momentum series. We even have on-ear and in-ear models in the Momentum range. The one I’ve mentioned is the flagship model from the series. Priced at around $300, these are certainly the most comfortable noise cancelling headphones you can score though at a hefty price. Its especially low profile was optimized for the use on mobile devices.Fitted with jack plugs on both ends, the cable is completely detachable and can be replaced if necessary. Talking about the design, we have a metal frame that connects one ear can to another, also enacting as a rigid frame for the headphones. Even the ear cans are made up of metal that surely makes them look special and helps them stand out. Talking about comfort, you get large thick foam padding that is going to cover your entire ear and also feel like foam pillows. Since the earcups feature an oval design, it will easily adjust with your ears; making plenty of room too. The headband however is sleek with minimal leather padding; which might cause slight irritation if you’re bald or going to wear them for a longer period of time. These however are definitely going to offer the kind of comfort you’ve always wished for. Since they’re wireless too, you’re not even going to have the trouble of dangling wires. The other features we have here is the Bluetooth 4.0 connectivity with support for Apt-x codec allowing them to deliver CD like quality. You can even connect them via audio cable to enjoy much better sound quality. Sennheiser has also incorporated it’s home-grown NoiseGard Noise Cancelling Technology, that makes use of 4 internal microphone to eliminate outside ambient noise at the maximum rate possible. For easy pairing, the company has also thrown-in NFC pairing, allowing you to instantly connect these to NFC supported devices. "Sennheiser Momentum 2.0 On Ear Wireless Headphones are definitely one of the most comfortable noise cancelling headphones out there, just the price at which it sits at is a deal breaker." When we’re talking about the most comfortable noise cancelling headphones, how can we forget a company that has been a pioneer in audio sound quality as well as with the comfort too. Though I don’t understand the logic, but Bang & Olufsen H8 are pricier than the H6; while featuring an on-ear design, whereas the H6 has an over the ear design. From pricer headphone models; its usually expected them to have over-ear design that allows for more room and sound visualization, compared to its on-ear counterpart. Before we talk about the headphones, let me first tell you what comes inside the box. ...find a full size carrying pouch and an airline adapter, along with user manual and paperwork. You even get a USB charging cable and auxiliary cable to connect your headphone to your smartphone via the 3.5mm jack, and that’s it in the accessories department. For the price they’re sold at, these are definitely one of the great looking and best feeling Headphones out there, primarily made out of Aluminum and Leather. Earcups swivel 90 degrees and lay flat on the ground, whereas the earpads are made of memory foam with leather covering. Earpads on the Grey Hazel model looks just like Chocolate Donut to me. Headband too has memory foam padding at the bottom, whereas leather covering at the top. Though at start you may complain that these are an on-ear model, however once you start using it; you really won’t feel much difference as the memory foam padding adjust to your ears and provide a good seal. You even have touch sensitive gesture control on the left side of earcups, allowing you to control things with ease without fidgeting to find buttons on the headphones itself. Check out this minimalistic review of Bang and Olufsen H8. Bose has been a pioneer when it comes to manufacturing some of the best noise cancelling headphones out there. Moreover at the same time they’ve also managed to preserve the sound quality as well as offer extreme comfort. Bose received a lot of flak for its QuietComfort 15 for having one-dimensional sound and not so exciting sound quality when the Noise Cancelling feature is turned on. Bose QuietComfort 25 are an upgrade over the QC15 which took 5 years in the making, with Bose persistent on not bringing any new ANC headphones until they have something new to offer. Well, that definitely worked as no other ANC headphones can closely touch the Noise Cancelling quality compared to QC25. Along with that you have your sound quality retained just the same when ANC feature is turned on. The best part is, the entire headphone is lightweight at 190 grams making them the lightest noise cancelling headphones out there. This is achieved by using plastic materials for the headband and earcups; whereas moderate earcup padding. You also get to see denim covering at the top of headband, and synthetic suede material at the bottom that is mostly used in luxury cars. Even when you just put them on; without any music playing, they passively block out most of the sound and once you have Noise Cancelling feature on, it’s just feels completely silent. ...that happens to be a great deal when your headphone runs out of battery and you no longer can use the noise cancelling feature. The company has gone with using a AAA battery to power these; which is sort of a good thing if you buy a set of rechargeable batteries along with it. ...and I’m glad they don't because with Bluetooth and Noise Cancelling feature turned on... it’s the music quality that suffers in the end. With a direct competitor to Bose’s newest noise cancelling headphone offering, the Sennheiser PXC 550 is the 'most stylish headphone' the German brand has designed till now. A modern design coupled with technologically advanced interface and magnificent sound, completes the short description for PXC550 and a competent competitor to the best noise cancelling headphone till now. As we’ve seen from Sennheiser headphones, the brand has managed to keep the overall weight down by using lighter materials and smart use of plastic and pseudo leather. The earcups have a rubberized finish and all the black design with chrome accents give it a business-like finish, and does feel professional as well. It’s memory foam padding covered with leather is comfortable for long use and since it offers 30 hours of playback time on full charge, longer listening sessions is fun on the PXC 550. This NFC enabled headphone offers Bluetooth 4.2 connectivity that consumes less power, offering more battery life and a better connectivity range as well. As you can see, there are no physical buttons on the Sennheiser PXC 550; it runs of gestures and intuitive controls. There’s no power button as well, if the earcups stay flat, the headphone switches off and when facing side to side; it turns ON. You also get a stylish D-shaped carrying case that allows the headphone to easily tuck, and few accessories like USB Cable, 3.5mm AUX cable, airline adapter and 3.5mm to 6.3mm adapter are included as well. This most comfortable noise cancelling headphone has 4 microphones that enables it to cancel outside noise and give you a quiet listening experience even at 20-30% volume. However if you feel the noise cancelling feature can be nauseating at times or you want to be aware of your surroundings, you can completely switch off noise cancelling with the provided toggle on earcup. There’s also na audio profile button, to switch from different audio modes like: music, speech, movie and so on. Most important feature about the Sennheiser PXC 550 is the touch pad on right earcups. It allows to play/pause by tapping twice, volume up and down by sliding your finger up and down, and slide finger left and right for forward and backward. Just when people were looking for top-of-the-line flagship wireless headphone from Bose, and a successor to the still successful Bose QC25, they dropped yet another successful product... called the QC35. With design cues being similar to QC25, the Bose Quiet Comfort 35 can now work without wires and a better sound quality and noise cancelling capabilities. 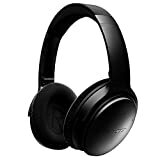 Available in Black and Silver color, the memory foam padded headphone from Bose; can be termed as the most comfortable noise cancelling headphones available in the market right now. Compared to previous model, the QC35 boasts a better built quality and one does not need to take optimum care while handling it. Talking about its construction, the entire frame is made up of durable plastic, while to turn things premium; the outer shell of earcups and headband is made of metal. Synthetic Leather is used to cover the top portion of headphone, while underneath it Alcantara is used, which is specifically used in premium cars from Audi, Lamborgini and so on. It takes around 2 hours to completely charge the battery, whereas work time is impeccable with 20 hours of battery life in wireless mode and 40 hours while using cable. However there’s no way to turn off the noise cancelling feature. Considering the previously mentioned Sennheiser PXC 550 that has gesture controls, its saddening to see button on Bose QC35 to handle different functions, but on the other side it isn’t deal breaker as using button is convenient rather than remembering different gestures. Noise Cancelling from Bose’s flagship offering is ‘the best’ and it’s hard to find another headphone that can come close to it. Sound quality on the QC35 is better and more relaxed compared to its previous iteration. The provided carrying case is rigid enough to carry these premium headphones and small enough to slide it anywhere. Headband as well on the QC35 doesn’t squeaks or squeal, and doesn’t loses shapes even while the headband is stretched more than required.